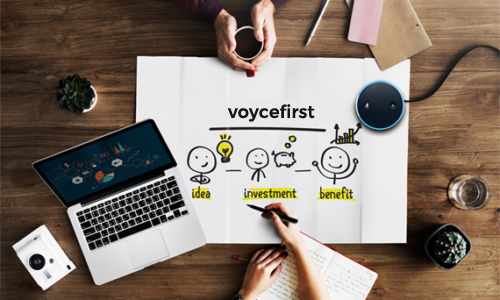 We at VoyceFirst help businesses leverage the power of Voice and Amazon Alexa. Our experienced voice technology team can understand, design and develop Alexa Skills for your business needs. Successful and Reliable Processes are born out of vast experience. Our approach to building Alexa skills is holistic, which make us one of the best Alexa Skill developing agencies globally. First step of building any solution is understanding the problem statement thoroughly. Our Business Analytics team will discuss and understand the full context of your business need for integrating a Voice interface. Post understanding of the context, we will create a detailed documentation of each and every use case defining the objective of the application and scope of the work. Ideal request and response design between user and Alexa. Identification and configuration of custom intents and in-built intents in the Alexa skill developer portal. Anticipating and making an exhaustive list of various combinations of sample utterances that the user might use. Small survey with a sample set to test the strength of the utterance pool. Configuration of custom slot types and custom slots with in-built Amazon slot types along with a detailed list of synonyms. End to end Alexa Skill architecture design with standard Service Oriented Architecture (SOA). Our technology team has expertise in designing and working on both SQL and NoSQL databases. We will suggest businesses what is the best database design to adopt to fulfill the respective use cases. Based on the devices that are needed to support the solution, we will configure the architecture accordingly for echo devices with and without visual support. Core logic and solution design. Development of complimenting mobile or web application if deemed necessary. Robust development of states and corresponding functionality of the intents using Alexa SDK. API integration with supporting or complimentary software systems wherever needed. Rigorous testing of every permutation and combination of voice utterances, slots and synonyms. Deployment using reliable cloud hardware that gives our clients ease and flexibility to scale. Continuous support provided with periodic audits of interaction model and cloud architecture. Timely backups of the database and strict versioning of code enables us to have chronological backups of the entire software suite. Add Alexa to your Business today!